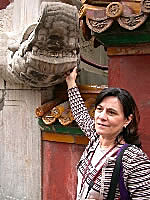 The dragon, one of the totems of ancient China, symbolizes good fortune in Chinese culture and folklore. According to legend the dragon has the head of a bull, the horns of a deer, the eyes of a lobster, the body of a snake, the claws of a hawk and the tail of a lion ... surely a creature that only lives in the imagination. According to Chinese folklore the dragon has nine sons. Each has its own assigned duty with its own likes and dislikes. 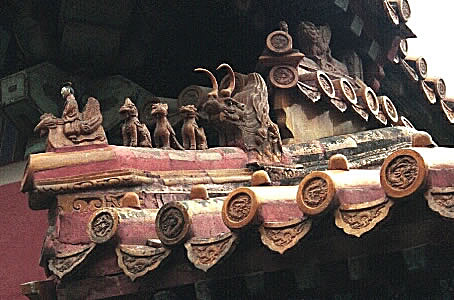 Because of these assigned duties they were often used to decorate the eaves, ridges, balustrades and terrace bases of ancient Chinese buildings, vessels and weapons. The names and habits of the dragon's nine sons vary between different records of the period, but the real question is: "Did the ancient Chinese people give the nine sons of the dragon different characters according to their decorative uses or give them different decorative uses according to their names?" When walking through the Imperial Palace one of our objectives was to locate and identify as many of the Nine Sons of the Dragon as we could. We managed to find only four. 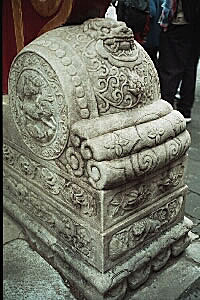 "Jiao Tu" is obedient and well behaved, so he is inscribed on the gate piers of palaces, gardens and residences. "Chi Shou " can extinguish fires, so the ancient Chinese placed him on the corners of palace terraces as a prayer for security from fire. 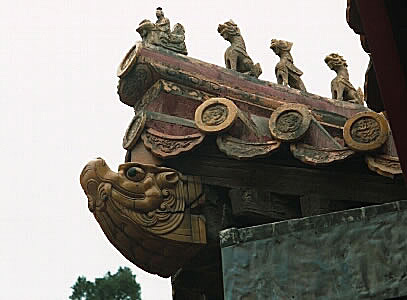 "Caho Feng " is fearless and loves to take risks, so the ancient Chinese used Caho Feng to decorate the corners of the palace roofs. 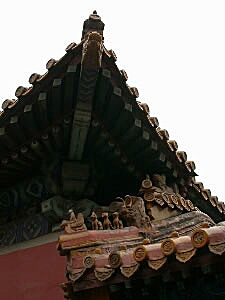 "Chi Wen " likes to scale heights and look into the distance, so he is put on the top of roof intersections. (Photo courtesy of my brother-in-law, John). Anne rubbing Caho Feng for good luck.